In this article we will learn commit and rollback commands in sql server. What is transaction in sql. Why do we need commit and rollback in sql server. Can we rollback a table after performing operation on that table. In previous articles we have learnt What is Lock and how to achieve lock on sql table. How high quality content affects your Website. Why every business needed digital Marketing and Why digital marketing Required. Authorization in Asp.Net. Before starting the Transaction commit and rollback , at first i am showing you my database structure. Insert and table creation script here. 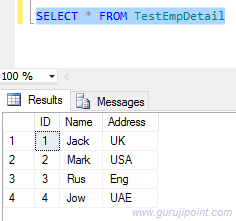 After inserting data Look at the table by using Select command. Commit is used for permanent changes in table. When commit perform in any query then the changes will not rollback. 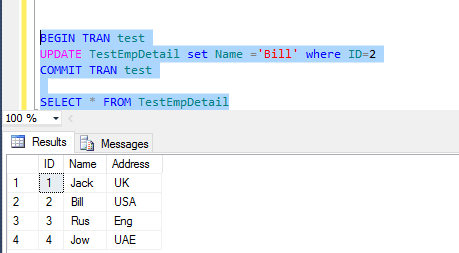 Here test is the Transaction name and we update the TestEmpDetail table for Id 2. And these changes are committed so this change will not rollback. 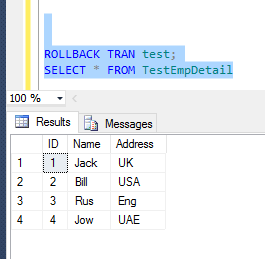 As its name suggest Rollback command is used for revert the changes done in table but before commit. The data which is committed or inserted into DB will not reverted or rollback. Now you can see after the Test transaction table has two new updated entries . 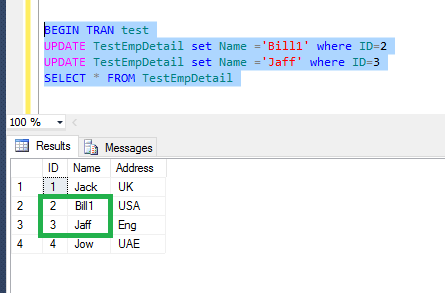 For id 2 and 3 named changes in SQL. Now i will perform rollback statement on test named Transaction. After rollback the newly updated table data has lost. Because we only performed Begin Trans and no commit transaction done .